Network Rail’s Queen Mary Viaduct project in East London has won a Bronze Green Apple Award in the Building and Construction category for Regeneration for Environmental Best Practice. The regeneration scheme, adjacent to Queen Mary University, was rewarded for its good environmental practice and social achievements. The Queen Mary Viaduct development, led by Network Rail in partnership with specialist contractor, Keltbray, Queen Mary University and the London Borough of Tower Hamlets, was presented with the award for the approach used in the demolition of a disused railway viaduct with 25 masonry arches to provide additional land for the university and the local community. This Network Rail project has enabled the development of an outdoor sports facility, storage buildings, and new student accommodation, comprising 412 new rooms with 36 rooms designed to accommodate students with disabilities. Network Rail will also transfer land previously designated for parking to London Borough of Tower Hamlets – to be used for neighbourhood allotments, benefitting the local community while also increasing habitat for wildlife and improving biodiversity. The scheme gained particular praise for implementation of sustainable practices on site, including the recycling of construction material, minimising waste, creating a ‘green roof’ to encourage bio-diversity and the reduction of carbon emissions associated with the project. 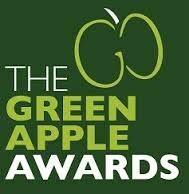 The Green Apple Environment Awards were launched in 1994 by The Green Organisation to recognise, reward and promote environmental best practice around the world.